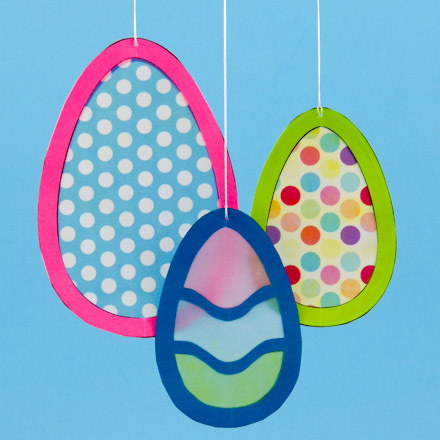 Make egg- or bunny-shaped suncatchers for Easter. These suncatchers can be hung in a window, included in a card, or made into a mobile. They also look cute hung from the handle of an Easter basket. Suncatchers are easy to make and are a great vehicle for creativity—make them in a variety of colors and add embellishments to dress them up. You'll get as much enjoyment from making suncatchers as from looking at them. Related crafts: Bookmark these suncatcher crafts for other holidays: Snowman and Angel Suncatcher Ornaments, Halloween Suncatchers and Valentine Suncatchers. Optional: Cellophane, foil, vellum, paper punches, and glitter. Choose a pattern for an Easter suncatcher—egg, fancy egg, or bunny. Each pattern is offered in black & white or pre-colored. Download the pattern and print it on white or colored computer paper. Pastel-colored paper is nice for the egg suncatchers. 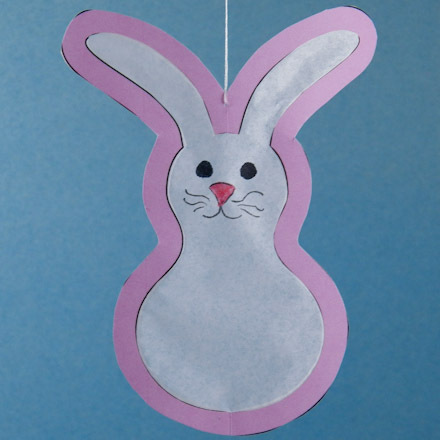 The bunny suncatcher is more difficult to make than either egg suncatcher. 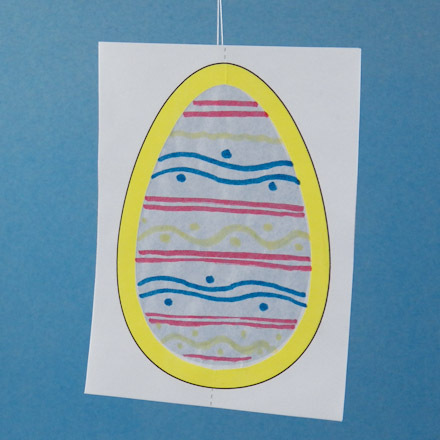 To make translucent centers, print the Egg Centers pattern on plain paper and wax it (see Waxing Paper craft). Toddlers and preschoolers can have fun, too! Use the Coloring Sheet or Easter Egg patterns to make Easter ornaments. Print a black & white or pre-colored pattern and give the child the sheet to color. Cut out the decorated egg and bunny shapes and glue two back-to-back to make an ornament. 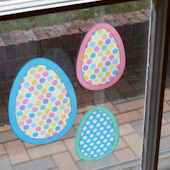 Quick suncatchers / window clings: For super easy suncatchers, print the Dotted Eggs pattern on white paper and make them translucent by Waxing Paper before cutting out the suncatchers. Tack them to the window with strings threaded through a punched hole or with a small application of glue dots on the top, bottom and sides. See samples below. It takes two frames to make a suncatcher. The egg and fancy egg suncatchers come in two sizes on each pattern sheet—small and large. The large suncatchers are about 3¾" (9.5 cm) tall and small ones are about 2¾" (7 cm) tall. The bunny suncatcher has one size—about 4¼" (10.5 cm) tall. Color the suncatcher frames, or leave them white. Draw tiny flowers, leaves on vines or maybe wavy lines in spring colors—use your imagination! Tip: The frame centers are also egg-shaped. 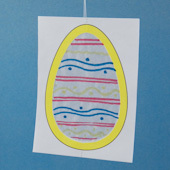 You can color theses cut-out eggs as you like, and then use them to decorate greeting cards. Cut on the box outline around the suncatcher and tissue patterns. Make the cuts straight and the corners square. Tip: There are two frame patterns for each suncatcher. Fold each box in half on the dashed line. Cut around each pattern on the solid black line. Do not cut along the fold. Cut out the centers of the frames. Now, open each piece flat. 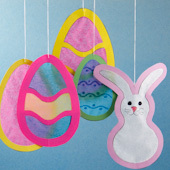 Keep the center egg or bunny to use as a card decoration. Tip: Trim around the edges, if needed. Easier option: The thin frames can be difficult for children to handle. An easier way to make the suncatcher frame is to just cut out the center—this simpler frame is a rectangle with an egg cut out. See sample in the sidebar. Put the tissue pattern face-up on a piece of tissue paper. Trace around the pattern with a pencil. Remove the pattern. Cut the tissue paper on the line you traced. 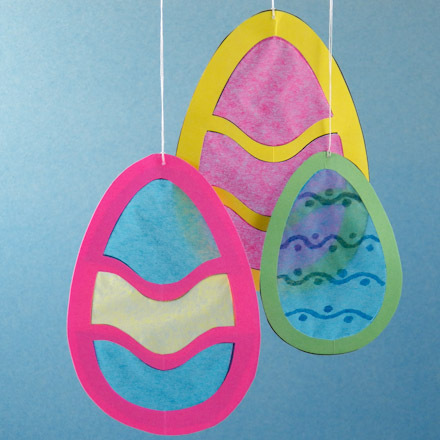 The tissue paper pattern for the fancy egg can be traced onto a single piece of tissue paper, or the pattern can be cut into three parts and traced onto three different colors of tissue paper. Tip: White tissue paper works well, but colored tissue paper is a nice option. You can also use foil, vellum or colored cellophane instead of tissue paper. Most craft stores and florists carry colored cellophane, and vellum is available in a variety of colors and patterns at craft and scrapbooking stores. Glue the tissue paper to the back of a suncatcher frame. Glue another frame on top, with the back sides together. In other words, glue the tissue paper between the two frames. To keep things neat, you may want to cover the table with a piece of waxed paper before gluing the tissue paper—sometimes the glue goes through the tissue paper and makes a sticky mess. Tip: A glue stick works well. Decide how you want to use your suncatcher. You may or may not want to add a hanger. To make a simple hanger, tape a loop of string or yarn to the top of the suncatcher. Tip: Another way to make a hanger is with needle and thread. Thread the needle with a doubled strand of thread about 12" (30 cm) long. Punch a hole with the needle in the center, top of the suncatcher. Pull the thread through the hole. Remove the needle. Put the tail through the loop and pull tight. Knot the two ends of the tail together. That's it! Your Easter suncatchers are ready to hang! 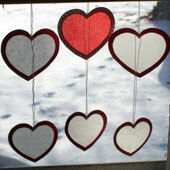 Valentine Suncatchers—See several ways to decorate and use suncatchers. Tip: Print the black & white patterns on colored paper. Make the bunny face with markers instead of the pattern cutouts. Tip: On the fancy egg, use one, two or even three colors of tissue paper. Use markers to decorate your eggs. Tip: Use plain paper that is waxed to make colorful, translucent centers for your suncatchers. See how to wax paper in the Waxing Paper craft project. The Egg Centers pattern was waxed to make these suncatchers. Tip: You can also make very easy suncatchers by waxing the entire egg using the Dotted Eggs pattern. See more details above. 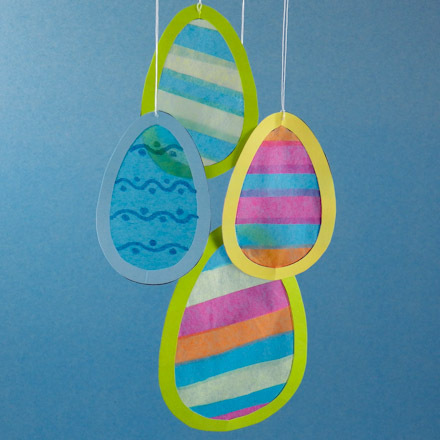 Tip: An easy way to make striped eggs is to use strips of colorful tissue paper. Cut strips that are about ½" by 2" to 4" from three or more colors of tissue paper. Apply glue to the back of one suncatcher frame. Starting from the top of the egg, lay the strips across the egg with each strip overlapping the previous one. Arrange the colors any way you like. Glue the second frame on top and trim away the excess tissue paper. Tip: For an easier option, just cut out the frame's center, leaving the rectangle around the egg intact. Then, cut a rectangle of tissue paper to glue between the frame layers.